The storm came on suddenly. A bank of clouds steamrolling in from the West. Brewing like a witch’s cauldron, it changes from blue to green and blots out the sun. Electricity slices across the sky and I see layers of clouds spinning counterclockwise above me. Deafening thunder explodes…around me…through me…inside me. Its percussion hits then trails off into nothingness, taking my heartbeat with it. As the storm bears down, the wind switches directions and turns cold. A depression develops in the clouds, sucking the air from my lungs as it expands outward. The tip of a funnel cloud emerges from its center. Descending then pulling back…choosing where to land…deciding what to destroy. 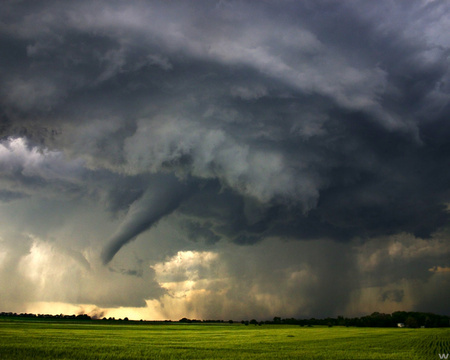 Another funnel cloud forms and connects with the earth, turning the tornado brown. It’s coming closer; stealthily crawling across the field. Cowering in a ravine, I cling to the roots of the trees around me. Their tops twist wildly with the wind and send vibrations down through the trunk to shake me uncontrollably. Branches begin splintering apart and clumps of dirt hit me like bullets as the roots work their way free of the embankment. My body becomes weightless and lifts into the air. My shoes are sucked from my feet and disappear. I hang on tightly; hugging the only anchor I have. I’m being tossed about like a rag doll and I feel my bones snapping to pieces.